Soda Stream is a fun alternative to store bought soda, and they have a ton of flavors to choose from. There is Ginger Ale, Rooter, Cranberry Raspberry, Zero Coke, Diet Lemon Lime, Diet Pink Grapefruit and they even have an Energy drink! 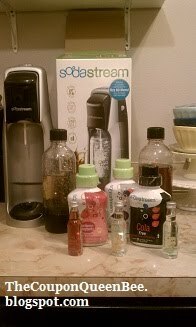 Soda Stream brought back a fond memory for me, I remember as a small child my Dad came home from the local fair with a soda making machine. It seems like such a dinosaur in comparison to this kit. In the old day you had to funnel the water through the top and wait and wait for it to become bubbly. There was like 2 flavors to choose from and it just tasted like syrup to me. Not something I enjoyed at all, and as a kid who wants to wait what feels like forever? Well the Soda Stream making machine was so simply that I could not believe it! All that we had to do was fill up the bottle with cold water, put it under the spout, twist it on like a cap and push the button three times. Then we added a cap full of whatever flavor we choose (we picked Rootbeer to start), put the cap on the bottle, flip it around a few times to mix up the flavor and we were done. It was awesome. In our first attempt we were a little apprehensive about holding the button down too long and it was not very bubbly. So on our second attempt we followed the directions (who knew) and it worked great. It took us only like 3 minutes to make the soda from start to finish. It comes with two bottles which was nice so that you could have two choices in the fridge for later. Also included were 3 bottles of flavoring for sparkling water, I tried the Lemon Lime and really liked it for a healthier feel. I brought the machine over to my parent’s house to show my Dad how far soda making has come. He was very impressed and could not wait to get started. My sister loved the idea of the Energy drink (she seems to drink them like water) and said it was great, tasted like Red Bull. She also said that the Energy drinks she buys in the store cost so much that this is a much cheaper alternative to that. In fact while I was there she and my brother polished off the whole bottle and made another one right away. After we finished making our sodas my Dad insisted I leave it there for him to enjoy for a few days, I really need to go back and get it or I will never see it again! 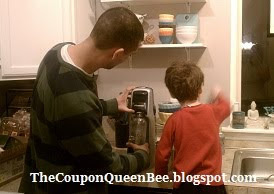 I think the Soda maker is a fun idea to do with older children; it is very interactive and easy to do. Your child can really help out and afterward enjoy a tasty beverage that they just helped make. The clean up was easy and the machine is so compact that it is easy to store in your cupboards. The one drawback for my husband and I is that we aren’t as into the diet drinks as others might be. This is a great product for other Mom’s wanting to cut calories and people who really enjoy a variety of diet drinks. I love that they not only cover all of the tradition flavors but they also have choices like Diet Pink Grapefruit and an Energy drink. Making homemade soda is a fun and cost effective way to enjoy a nice cold drink. You can purchase your own Soda Stream at Macy's, Sears, Bed Bath & Beyond and many more locations. You can find a location near you here. If you would like more info in Soda Stream you can follow them on twitter and facebook. *The opinions in this review are my own. I was not paid for this review. I was sent one Soda Steam kit for free for my review.